There is lots happening in the Ransley household at the moment. I am doing some Easter crafts for the grand children including these adorable little rabbits which are a Rosalie Quinlan design. I just have to embroider their little faces and stitch their tummies down and then they are finished. Aren't they cute ? There has also been some gardening. Hubby asked me if it would be ok to remove some of the roses that had gone to briar in the back garden. I returned home to this !! A totally eradicated garden ! I have decided to look upon it as a positive and will re-design this area of garden. He is off interstate on the weekend for a week or so and I plan to get a bit done before he returns. I have been making little brooches and hair clips and other little crafty bits when I am not in the mood for stitching. This tray of bits and pieces sits next to my sewing chair so I can just pick it up when the whim comes. It makes it much easier having everything together. Our litter of Tonkinese babies are growing up fast and are almost at the age of going to new homes. It is such fun having them to play with but I think Beatrice their mum is just about over babies the poor thing. I think she will enjoy the rest once they have left home. 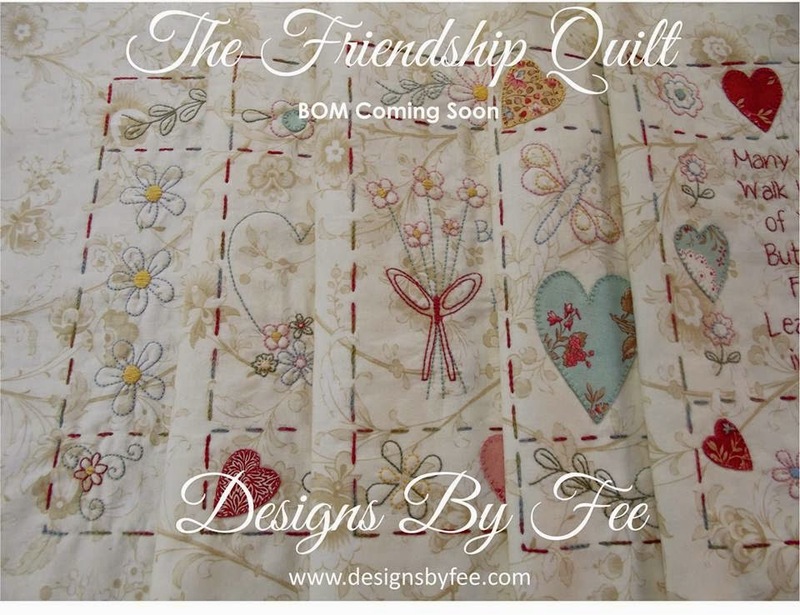 And finally I am into the home straight with my new Block of The Month - "The Friendship Quilt" - I can't wait to show you it finished - Hopefully after the Easter break. Lovely Fee, so many new creations. Even the garden will be a new creation. I am not a cat person, but that cat is adorable. Love those little bunnies, so cute. And the box of sewing beside the sewing chair is such a good idea.